With new food safety regulations rolling out in Canada on the heels of the new American legislation it’s important that businesses know what’s changed, and what employees need to be doing differently, in order to meet compliance. So, it’s no surprise that one of the biggest trends in the industry is ensuring that proper food safety training is available to employees, and that they retain what they’re learning. We know from other sources that the top challenges to food safety training are shifting. Companies surveyed in the 2018 Global Food Safety Training Survey demonstrated a strong commitment to food safety, but noted there are gaps in executing it. And a lack of resources continues to be a major issue. Food companies identified their top three food safety challenges as scheduling time for training, verifying effective training has taken place, and organizing refresher training. The old ways of training (reading manuals, on-the-job) are not as effective as they used to be, due to changing demographics and learning styles. Best-practice companies are now using interactive training, micro-training, redesigned onboarding, e-learning kiosks, supervisor huddles, digital signage, and other tools to engage today’s frontline employees and ensure knowledge retention. • Consistent up-to-date information. With the plethora of technology and advancements available to deliver training, providers can provide courses that meet industry and government regulations in a variety of settings: live training, e-learning, virtual learning, conference workshops and in-house training. • Interactive and engaging content. Engaging employees through the use of technology can net excellent results for learning. • Content in multiple languages. Food industry employees are diverse, and, for many, English is not their primary language. • And, finally, training providers need to automatically document and report on results; having a defensible training record stored digitally in a central location is key. There are many excellent training courses and programs available on the market but it can be challenging for a food company to determine which programs offer the best content and format for their employees. 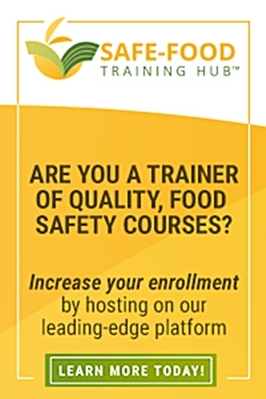 The new Safe-Food Training Hub™ from Global Food Safety Resource® aims to address this by simplifying the ability for food companies, of all sizes, to source flexible training options from quality vendors. An investment in training will give practitioners an opportunity to build on skills that will benefit an organization’s overall record of compliance and adherence to food safety standards. 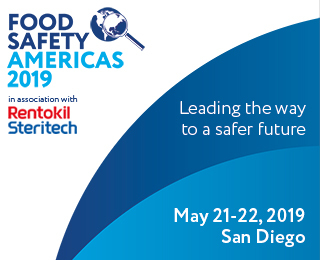 Tina Brillinger is President and Founder of Global Food Safety Resource which publishes interactive digital food safety content through a variety of channels and platforms to educate and inform food professionals about best practices to meet food safety standards and compliance. Tina’s latest product is the Safe-Food Training Hub™ an e-commerce platform that provides flexible learning courses by the world’s leading training vendors, based on a companies individual needs. To learn more visit: globalfoodsafetyresource.com or safefoodtraininghub.com.